On March 13, state investigators served a criminal search warrant at 887 Mesa Road in Nipomo and discovered the operator was processing marijuana grown illegally at another site. San Luis Obispo County permits only processing of cannabis grown on site while the state requires manufactures to hold a state processing license. During the meeting, a CFAM Management representative said a county staffer had sent a request to the state to allow CFAM to process cannabis from other cultivation sites. As a result, the state had granted them a temporary processing license. County officials argued that it was clear that the county ordinance did not allow processing of cannabis grown offsite, and that the state had revoked CFAM Management’s processing license in Dec. 2018. In addition, even with a processor permit, the manufacturing of marijuana grown at an unlicensed cultivation site is illegal. CFAM’s representative also argued that a Cal Coast Times article on the March 13 state raid was inaccurate, claiming it was a standard inspection. While the state did conduct a standard inspection on March 13, it led to the service of a criminal search warrant, according to the county resolution denying the project. “On March 13, the California Department of Fish and Wildlife and California Department of Food and Agriculture CalCannabis enforcement division (CDFA), in coordination with Department of Planning & Building Code Enforcement, inspected CFAM Management Group, Inc. and violations of County Code and the Abeyance Resolution were identified, and the CDFA subsequently executed a criminal search warrant at the property for alleged violations of state law separate and apart from County Code Enforcement,” the resolution says. During Tuesday’s board of supervisors meeting, county staffers noted multiple violations for unpermitted structures, unpermitted electrical work, manufacturing violations, failures to abide by plant count restrictions, and multiple confirmed odor violations. Even though county inspectors repeatedly noted the ongoing violations at the CFAM Management site, little enforcement action was taken. CFAM Management also argued that even though issues had been found in the past, most did not result in official violations and therefore they should be allowed to remain in business while they work to correct their compliance issues. 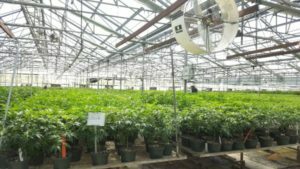 However, the board voted unanimously to revoke CFAM Management’s permits for 22,000 square feet of indoor cultivation, 264,632 square feet of nursery plants, a 4,284 square foot tissue culture lab, and a 42,797 square foot drying and processing area, and ordered the company to cease operations. Great news! Now a relative of someone with political connections in the county will get a cultivation license! If you want to have a legal cannabis farm, you need to bribe early and often. I’m 100% certain someone with out-of-town political connections, a felony record and a ton of campaign contributions and other forms of quasi-legal bribery will be able to step in and take up the slack before this thing goes to pot. The irony is that it would be better if pot remained illegal, but a low law enforcement priority. Just buy your pot from some dude or grow a couple plants at home and not have the rampant government corruption (Grover Beach and SLO) and expensive enforcement activity associated with the “legal” cannabis industry. If only they had planted grape vines in some of the rows and had a tasting room. I guess this is a preview of all of the tax income that we have heard about. I think now it’s clear that the tax income from residents will be paying for what appears to be the upcoming failure of the legalization of marijuana. Marijuana is much less legal now than it was at 11:59 PM, Dec 31st, 2017. That’s cuz boobus americanus voted for something that said “legal” without the skill to read the fine print.